NEW single of Zelimir's - in Norwegian for the first time! 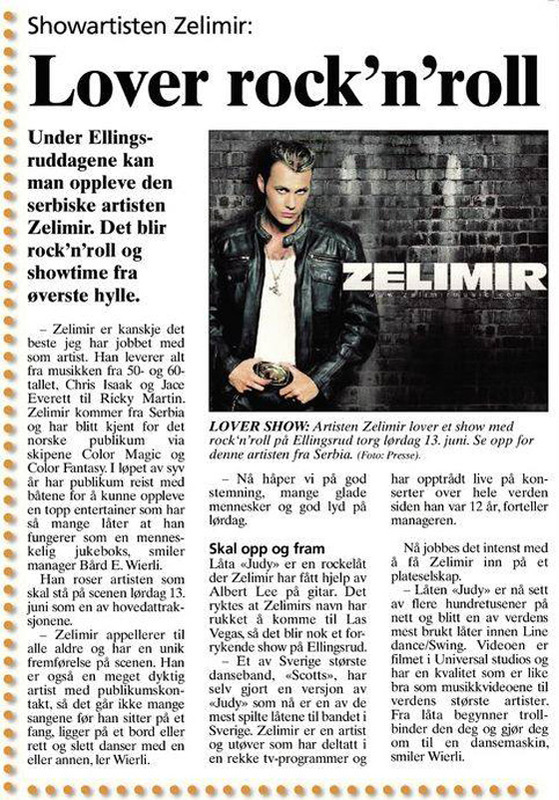 NEW single of Zelimir's - in Norwegian for the first time! Inspired by the music Zelimir is performing in the latest play "En Tjener for To Herrer" at the "Oslo Nye Teater" throughout September and October. "One Man, Two Guvnors on Broadway"
Next two months you're gonna see Zelimir at the Oslo Nye Teater in the #EnTjenerForToHerrer, Norwegian edition of the Broadway play "One Man, Two Guvnors". 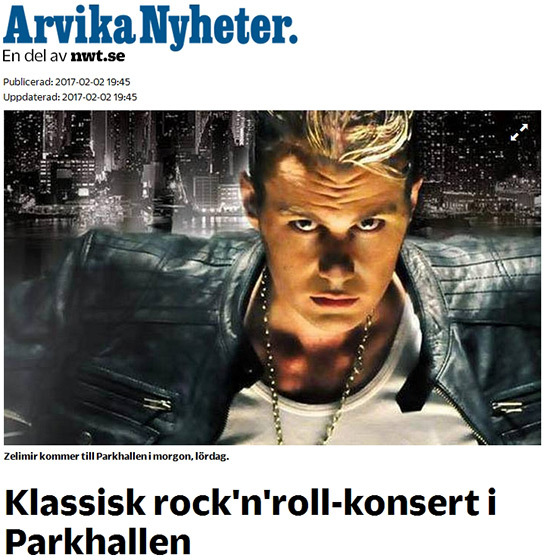 "En forrykende plate og en gledelig overraskelse"
Zelimir rocks the full house of Arvika Parken for 4 hours without a break! An about one hour drive, up above Oslo, in the Norwegian woods at Braastad Gaard, Norwegian star Marian Aas Hansen and Zelimir had a photo shoot for the cd cover of their new upcoming duet/single "One Small Step". The song is an old song from Marian's first album, this time made as a new production of Zelimir's and his music team in Nashville, Tennessee USA. This is going to be their first official duet coming out this Fall. 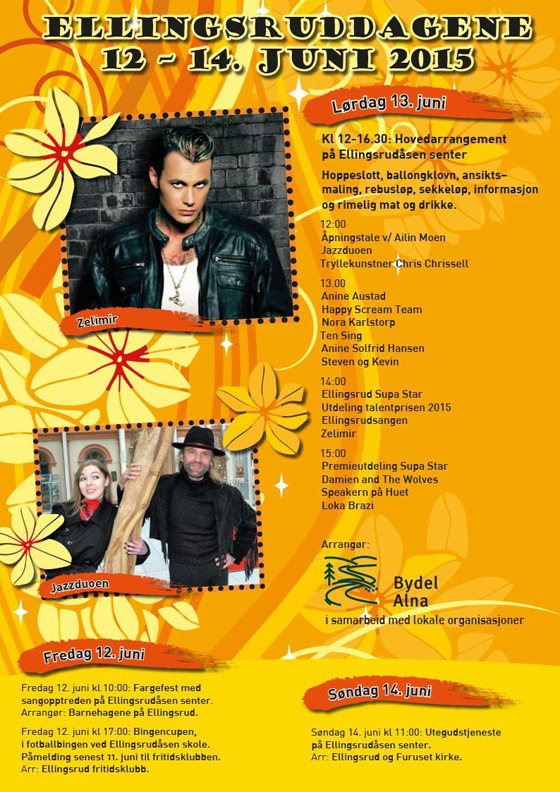 Make sure you don't miss out on Zelimir and Marian performing live at Braastad Gaard, Roa Norway this Saturday, June 20. 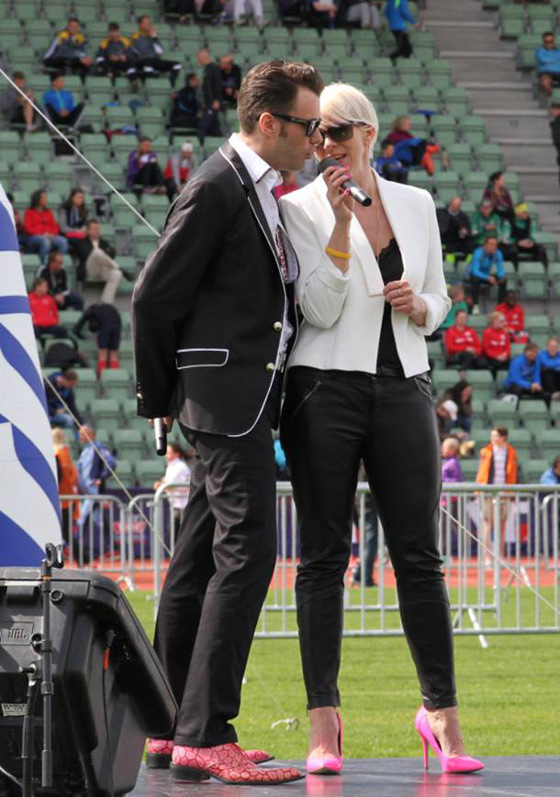 Marian Aas Hansen and Zelimir once again performed together, giving their support and contribution to the iCare organization and a "Sing for sight” event helping blind people. This is just the beginning of many of the future collaborations between the two. Stay tuned as Zelimir & Marian are soon entering the studio, to record a duet version to one of the Marian’s hits "One Small Step". As a part of an Elvis cruise on M/S Color Magic, which took place on May 2nd/3rd 2015 in Oslo, Norway Zelimir, his design team headed by Dejan Ilic and in a colaboration with the VIP Booking / Color Line presented a spectacular, never before seen shows onboard the vessel. 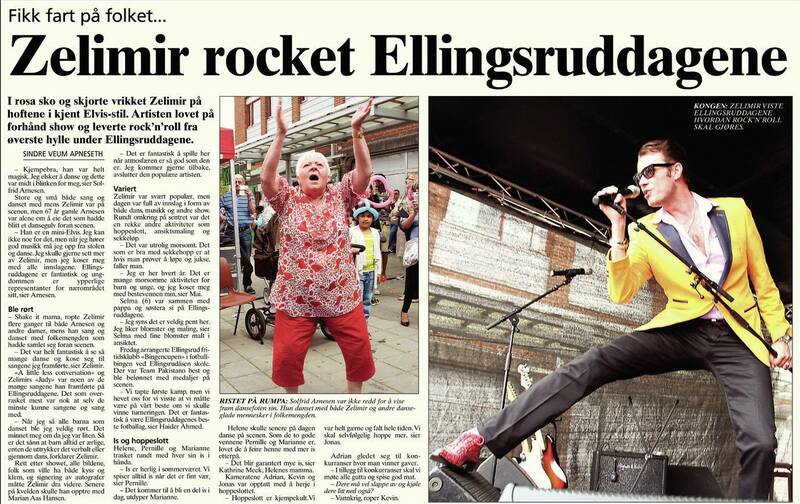 Zelimir was on fire, appearing live onstage, delighting the, more than ready, Norwegian and German crowds. Changing his signature colourful clothes in almost every song, while The King was appearing on a huge LED screens behind. Unforgettable visuals, graphics, and movie footages of Elvis’ got some tears rolling down the faces to the many onboard both nights. 1st night's show entitled “Elvis Hollywood Walk of Fame by Zelimir” started out with both Elvis and Zelimir appearing on a big screen “Looking for a Trouble", leading us into Zelimir's unforgettable performance of Elvis’ most loved movie hits. 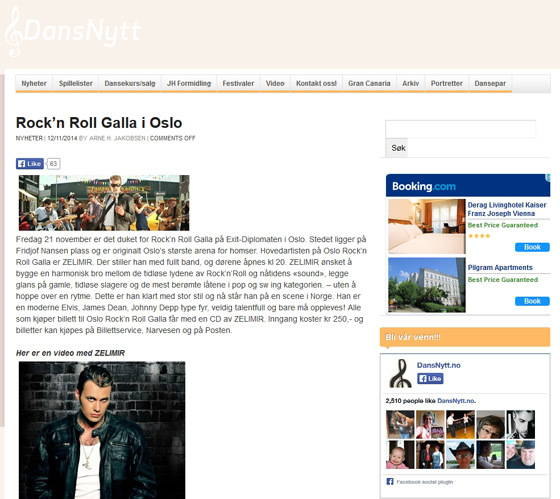 Also featured a Norwegian born Solvor Woll. Show ended up with Zelimir’s hit song "Judy" getting all the crowd on their feet cheering and dancing. 2ns night’s show entitled “Elvis Songbook by Zelimir” presented Zelimir in a more casual and an intimate type of performance. He sang his favourite songs of Elvis’ which the auditorium once again, accepted open hearted. Beautiful visuals and graphics together with Zelimir’s energetic performance, ft. Solvor Woll made everyone speechless. Concert ended up with “Judy”, Zelimir’s current charter, making everyone scream and shout. We also heard “ Judy" both nights in a Monkey Pub onboard “ Magic", making everyone line dancing. 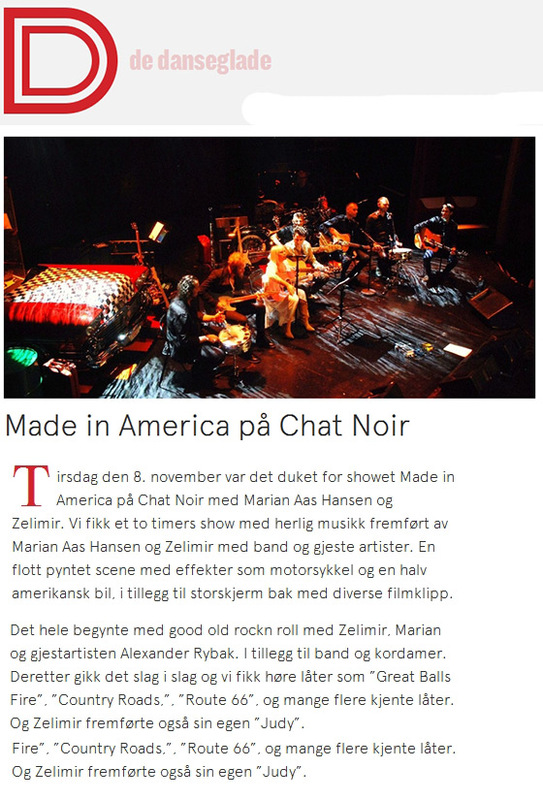 Performed by Robert and Espen. After Zelimir’s shows, there were many other great Norwegian artists paying a tribute to the King with the Ol’ McDonalds band. They were: Anders Ulstad, Kristian Lysebråte, Christian Ingebrigtsen, Gaute Ormåsen, Kjetil Tefke, Robert og Espen, Henning Fladberg, Magic Moments and Lars-Erik Plumbo Blokkhus. 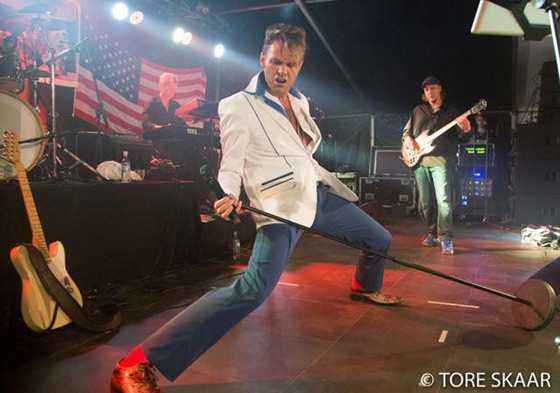 Until the next Elvis cruise in September 2015, TCE everyone. Welcome to the magical and one of a kind, an unforgettable ELVIS CRUISE! Once again, Zelimir is taking a part at the magical Elvis Cruise onboard Color Magic on May 2nd and 3rd, 2015. This time as a Cruise’s headline artist at the ship's show lounge. 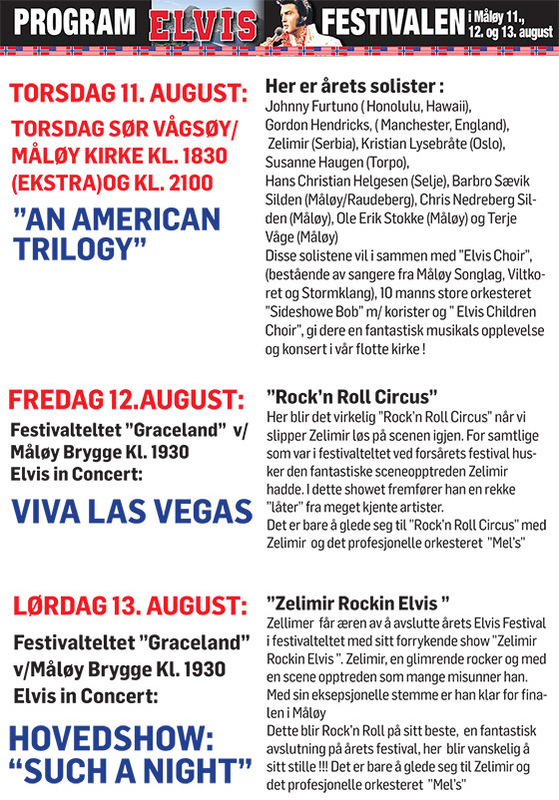 A brand new outlook to the Rock'n'Roll Era, Elvis from the movies and Elvis' best years portrayed by Zelimir in a unique, never before seen visuals, energetic performances, virtual productions of ELVIS appearing via video on a central and side screens, and Zelimir appearing on a central stage Live at the same time. Introducing a special guest, Solvor Woll both nights. Dejan Ilic, his design and video team, altogether with the VIP Booking & Management, and Color Line are doing their best to prepare an unforgettable experience for all the Elvis Fans. 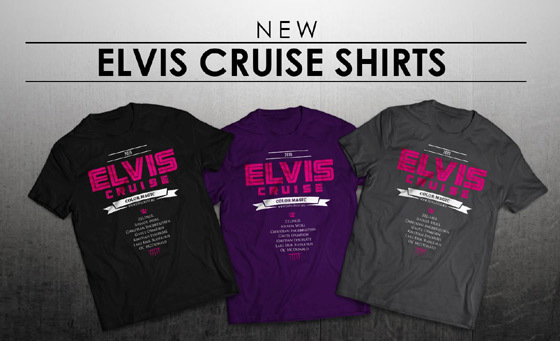 May 2nd: "Elvis - Hollywood Walk of Fame by ZELIMIR"
May 3rd: "Elvis Songbook by ZELIMIR"
Don't forget to pre-order the ELVIS CRUISE 2015 Official T'Shirt! ZELIMIR as never seen before! LIVE appearances streaming online! Yes, on internet! Yes, virtually at your "Home", and Yes, in REALTIME! 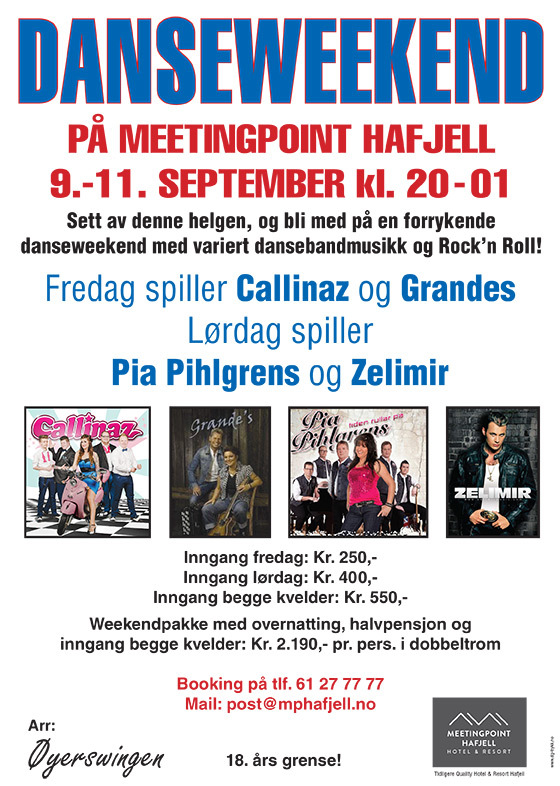 You will be able to see Zelimir Live from a rehearsal, a backstage, office, studio or his bedroom, kitchen or even a bathroom! ZELIMIR once again is offering his fans a new and unique experience that everybody's gonna love, and what is best, to be a part of it! Fans will be able to request a song, chat with Zelimir, even leave a tip. Isn't that cool or what! Are you in India, Australia, Norway, Japan or Serbia? NO PROBLEM! Just turn your computer ON, go online, tune in (at www.zelimirmusic.com/tv.html) connect it to your TV if you wish, buy a virtual ticket just like you'd usually do if you went to see a Live event! Only this time, you don't have to look out for a parking, or dress up! Invite your friends, have a drink or two. Take your sit in the front row of your living room (or a bedroom) in front of your Flat tv or a laptop computer, tablet or a mobile phone! Crank up your speakers and ROCK'N'ROLL! 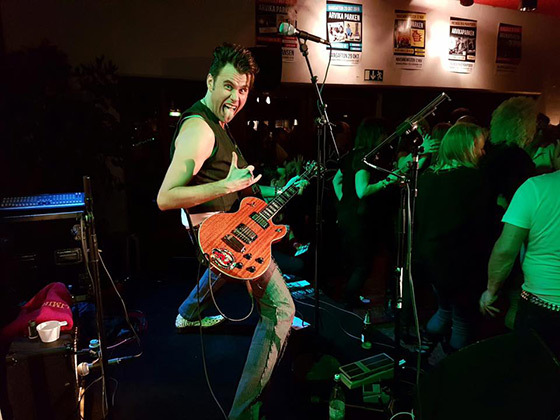 Next Sunday January 11th, to celebrate Elvis' 80th Birthday (and yes, we know his Birthday is January 8th), Zelimir will be broadcasted Live from his home in a "Happy Birthday ELVIS"! Our first Online TV Show. So, welcome to "Z LiVe TV" Shows! "Judy Likes To Rock!" is a Global Line Dance Mania, spreading like a virus, as we speak. Dozens of videos of a people; all colors, nationalities, ages and genders dancing to their own choreographies to the song. Fans are using nothing but word of mouth and good taste in music What is so special about “Judy” is that it is a contemporary original Country/Rock’n’Roll tune, and not just a Rock’n’Roll cover song from the 50s and 60s. People seem to be recognising that quality right away. A lot of soul, a lot of heart, a lot of love went into this song and people react and respond to it, word of mouth is spreading, and it’s all over YouTube." 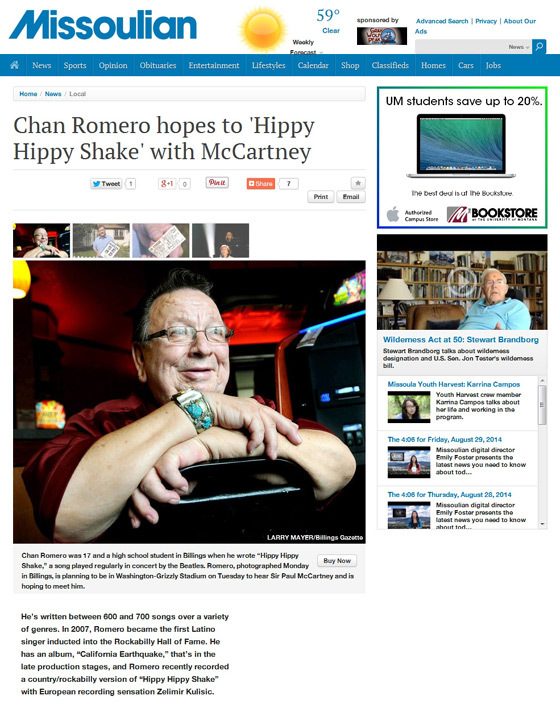 In July 2014 Zelimir travels to California to record collaboration with Chan Romero, original Singer-Songwriter for the the iconic R&R gem,"Hippy Hippy Shake", previously recorded by The Beatles, song appears in numerous film soundtracks such as,"Cocktail" with Tom Cruise, Disney’s, "Angels In The Outfield", cult favorite "Austin Powers", "X-Men 2013" as well as several national commercials such as Burger King and Zelimir will also be recording in Spanish catering to an Hispanic market of 550 million potential consumers. During his trip to America he will also visit LA and Nashville to meet with music publishers and record labels to coordinate his crossover efforts outside of his domestic territory. 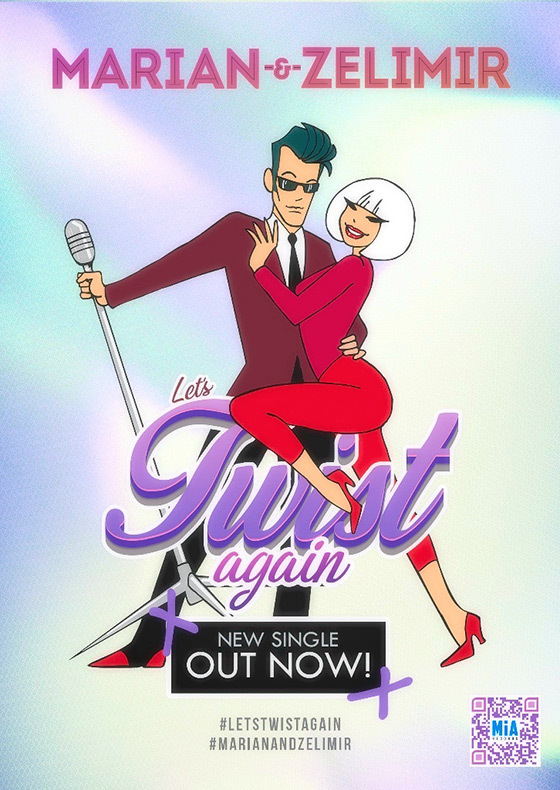 Riding high on the winds of success from his latest Single "Judy" that took Europe by storm, making it top #100 list in many countries while steadily climbing the charts, Zelimir wants to give you a perfect gift of love for St Valentines, another smashing single: “Good Morning My Darling”! On February 14th you will be able to enjoy two versions of this passionate and tender song - Full Studio Version and an Unplugged/Acoustic Version- both mastered by Nashville’s finest musicians and producers. 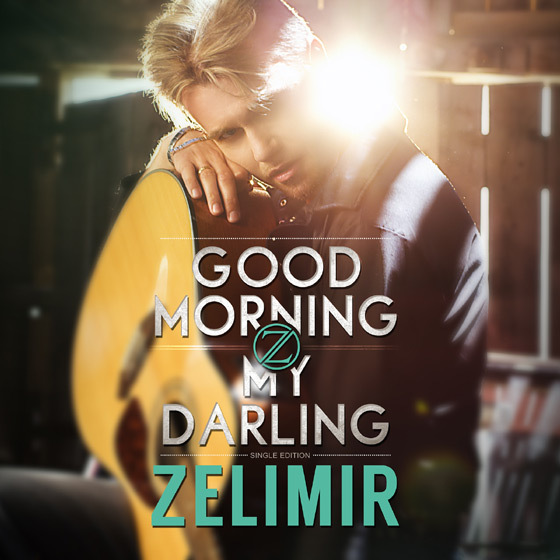 So wind your clocks, set your alarms and remind yourselves that on February 14th you will fall in love with Zelimir’s “Good Morning My Darling” available on iTunes, Amazon MP3, Google Play, Spotify, and many more." 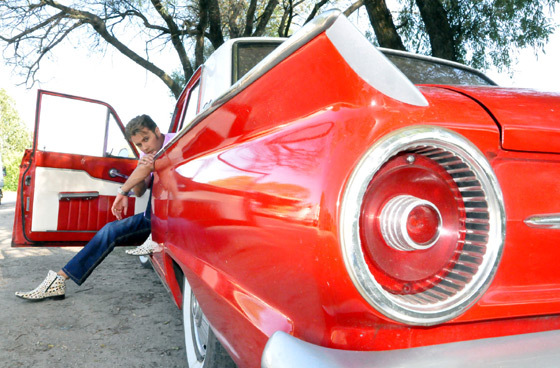 Zelimir (his name means "wanting peace") was born on June 23, 1977 in Novi Sad, Yugoslavia, to a musical family. From an early age it was clear that he would be an entertainer. 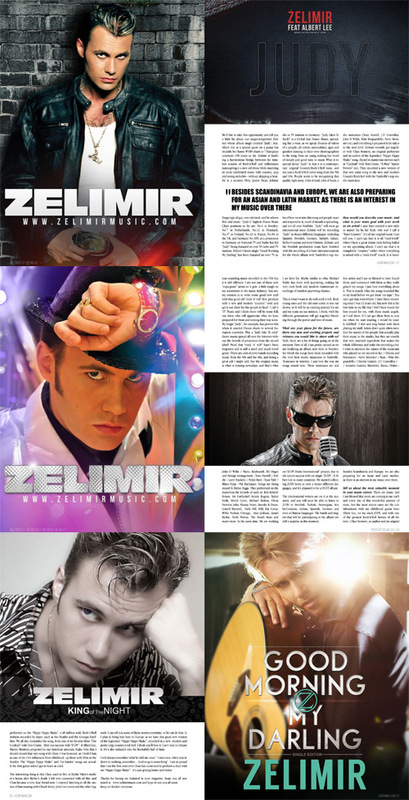 ZelimirMusic.com. All Rights Reserved. Powered by MAGNET Studio. Graphic design - logo/brand: Dejan Ilic.